Houlihan Lawrence President Chris Meyers, foreground, during presentation by Nick Churton, managing director of Mayfair International Realty. 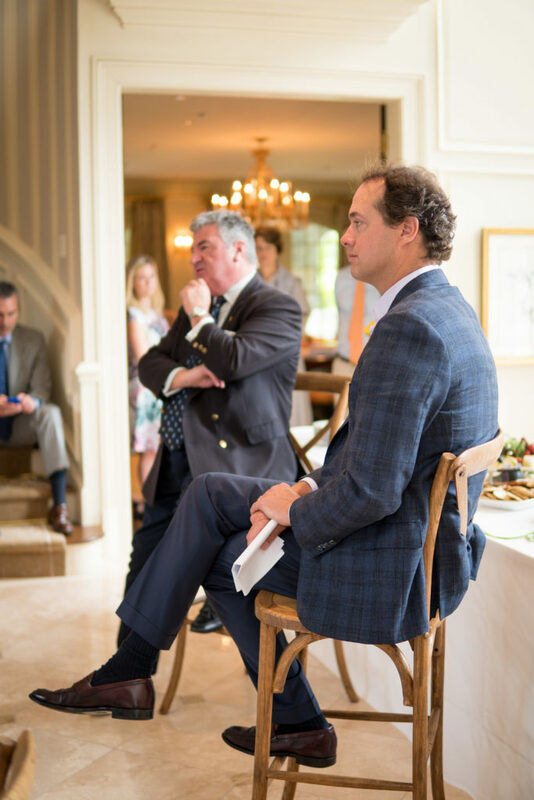 PURCHASE—More than 60 Houlihan Lawrence agents gathered for a forum on the international luxury market that featured a conversation with the brokerage firm’s president Chris Meyers, and Nick Churton, managing director of Mayfair International Realty. The two talked about trends in the international market and today’s changing demographics. The forum was held at 5 Sarosca Farm in Purchase, which is listed with the firm at $10.95 million. Mayfair operates as the London office of Houlihan Lawrence. Churton stressed the importance of London as an international business center and utilizing the firm’s global reach in selling specialized luxury properties in our markets. As a case study for success, Meyers cited a modern home Houlihan Lawrence had listed in Columbia County, NY, designed by legendary contemporary artist and activist Ai Weiwei. The ultimate buyer was traveling in Singapore and had seen the property in a Financial Times piece placed as part of Mayfair’s international public relations strategy for the property. 5 Sarosca Farm Laneis a 16,764-square-foot, 19-room estate located on 7.23 acres overlooking Old Oaks Country Club. Among the property’s most unique attributes is an extensive sports facility, boasting batting gates, putting greens, a soccer field, a regulation-sized basketball court and a tennis court.